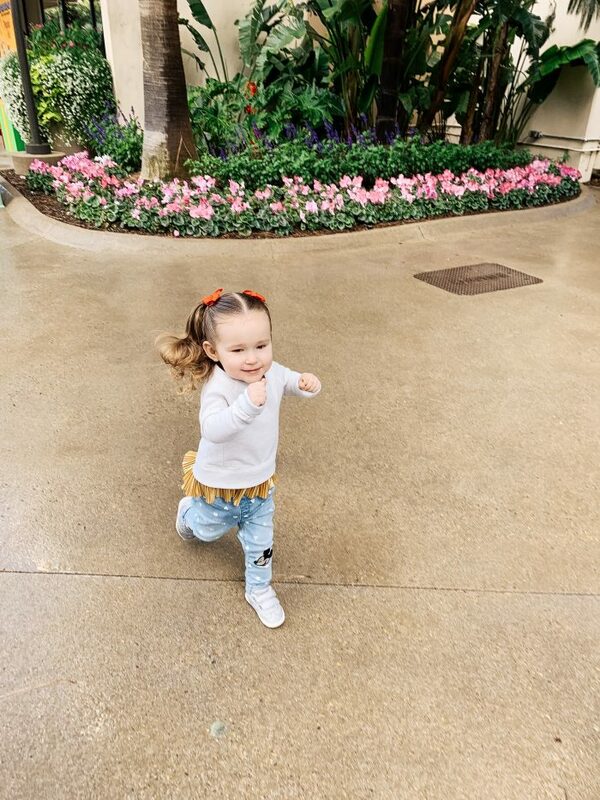 Our Disneyland with toddlers video! What a trip! It all started when I thought I was about to go absolutely crazy. “FREAKING GET ME OUTTA THIS COLD WEATHER” were the thoughts that would just race in my head ALL. DAY. LONG. It might sound dramatic but I legitimately think I get seasonal depression every year because I cannot handle the incessant dark cold environment that Utah is. I mean, I haven’t been diagnosed by a doctor but I basically have to constantly give myself pep talks every 3 minutes to try to convince myself that I’m okay and that I shouldn’t just crawl back in bed all day long. So….I booked a trip to Disneyland! Literally 2 weeks in advance. 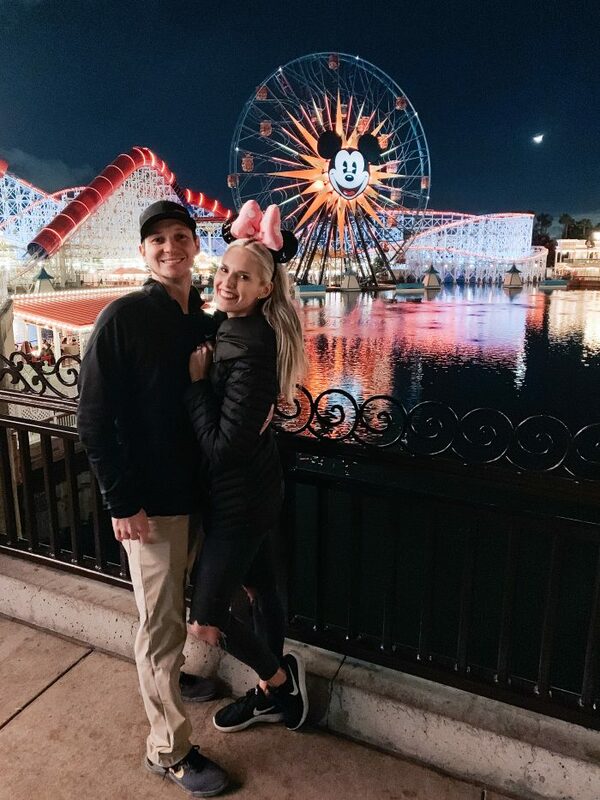 And we spent way too much money because of it, and it kind of gives me a anxiety a little, so if you book a trip to Disneyland, I think you should probably not do it 2 weeks in advance. More on saving you money later. We had a really good time and I loved spending time with my family! My mom and step dad came, too, and my sister and her cute boyfriend came with us the first day since they live there. I know, right? Why do they think they are living in such a glorious place all year round. People these days. We went to California Adventure the first day, and Disneyland the first day. My friend Oakley recommended just doing one park per day with toddlers and it was such a great idea. Harris and Goldie literally couldn’t believe their eyes in Cars Land. We have probably watched that movie 100 times NO JOKE. They LOVE it! It’s one of those movies that is adorable for adults to watch, too, and it has a good message so I’m all about it. They love Sally, McQueen (they used to call the movie “Queen” when we first started watching it), Luigi, Guido, Cruz, Fillmore…you name it. They know all of the characters and love them all. My only quip about Cars Land is that they couldn’t ride the main ride. They would have been in HEAVEN, but they were too short. Something to look forward to. On the morning of our Disneyland Park adventure, it was just us 4 because the rest of my family didn’t come with us that day. I was hurriedly trying to get ready so we could squeeze every last ounce out of our day, and I made a mistake that I’ve never made at home. I left my scalding hot curling iron on the edge of the sink when I was getting ready, and Goldie grabbed it. OH BOY. I feel SO bad. She burned her sweet hand and it was so sad. We called up a nurse, and ran her hand under the cold sink for over an hour. She put burn cream on it but it didn’t help. Finally we distracted her enough to head to the park and she was fine for about 30 minutes…then it started burning again in the line for Peter Pan. The only time she would be okay would be when Tyler was blowing on her hand. She kept yelling, “blow on it! 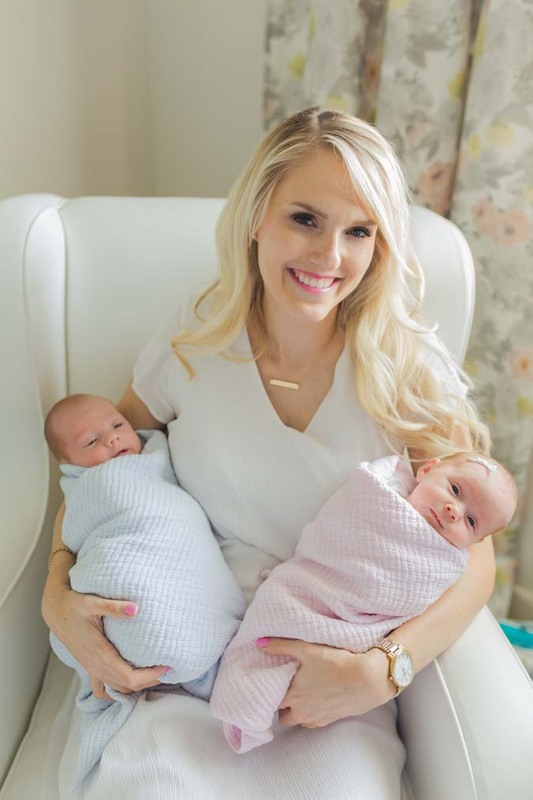 !” Tyler was getting light headed from blowing on her hand so much, so I finally asked him to take her to the nurse’s station to see if there was anything that they could do. I took Harris to Toon Town with me. He was being SO patient and SO sweet with his sister. He was perfect. We went on a ride in Toon Town, then as we were walking out, we ran into Pluto. I was absolutely shocked when Harris gave him a hug! SHOCKED! I promise you on my life that Disneyland changed him. He is STILL changed for the better. He used to be nervous around a lot of people, including grandparents, and especially new people. NOW HE’S NOT! It’s like being around all of the big characters gave him a sense of confidence and he wasn’t scared of them AT ALL! Oh, my precious boy. We went to Mickey’s House next and it was so magical to see this sweet boy look around at everything. He was fascinated. I still remember my first time to Disneyland. I was probably 10 and I still remember how unbelievably amazing Mickey and Minnie’s houses were. I dreamed about them for years after. To see my boy with the magic and wonder in his eyes as he took it all in was priceless. Harris and I went on his first roller coaster in Toon Town which he LOVED! We lucked out because it was the last ride before it shut down because of rain. 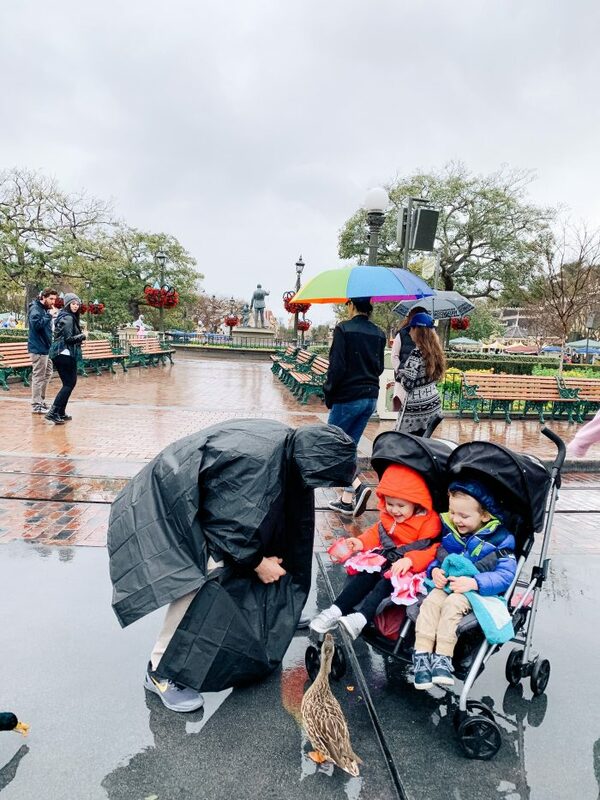 We then walked in the rain a bit to the train station where he was happy to board the little train and super excited to show me that he had Mickey pretzels in his pocket. He is the sweetest thing. No one loves pretzels more than him. After many tears, Tyler decided to take Goldie back to the hotel and Harris and I would get our food. Phew. Somewhere in here I managed to stand in line at the Jolly Holiday and get a Mickey raspberry macaroon which basically redeemed my whole day. After walking back to the hotel, we met up with Goldie and Tyler, I gave him his food so he could eat, and we all crashed for a couple hours in our beds. We all needed it. When we woke up, Goldie appeared to be doing much, much better, and we decided to brave the park again with renewed spirits. It was a little cold (still warmer than Utah), so it didn’t bother us but a lot of people had left the park. This is where our day was SAVED. Oh, thank goodness. We were able to almost walk on about 15 rides!! I mean…rarely can you do that at Disneyland. We got to meet Mickey Mouse after waiting only about 5 minutes, we got to ride several rides twice in a row (like Winnie the Pooh) and got to go on all that we wanted to. THANK GOODNESS! The Mickey magic is real, people. It was a fantastic night. We went on It’s A Small World again and Goldie could actually enjoy it because she wasn’t in pain. 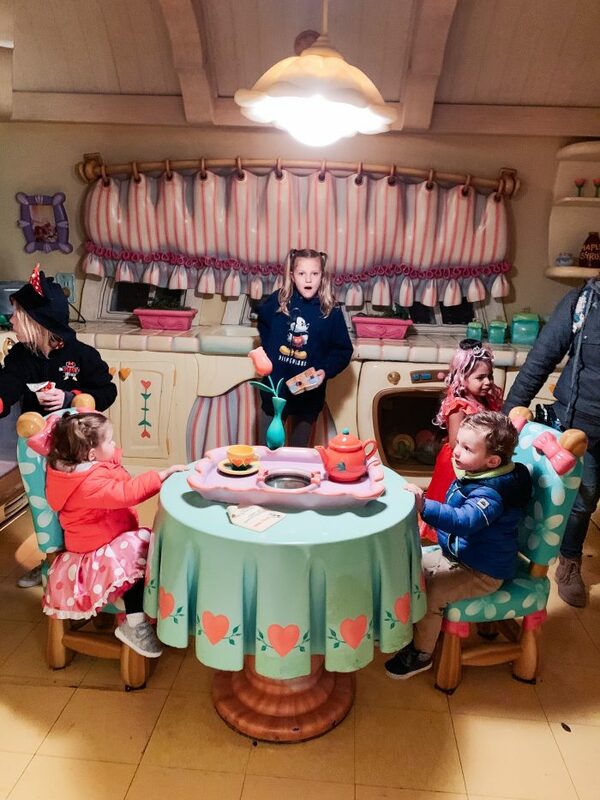 Mickey and Minnie’s houses were pure magic for the kids and for us because we saw the joy in their eyes. It was pure happiness for a couple of hours. We used on the online ordering app that Disneyland has to order our dinner from the Jolly Holiday and walked right up to get our dinner. We sat outside and ate our soup, and the kids liked their dinner. The fireworks were wonderful, albeit slightly less magical since the castle is under complete renovation so it was down. The kids loved it. We loved it. And what a relief for this mama that we got to have a fun evening. I think my favorite part may have been this that I posted on Instagram here: As we were about to get lunch with Goldie very, very upset as we stood in the rain, super hungry and unable to do much of anything in the day thus far, I told Tyler, “This is ruining our whole day!” He smiled at me and said, “No it’s not. It’s just more adventurous.” He could have gotten mad at me for leaving the curling iron too close to the edge (I’m always sooo careful at home) or had a bad attitude about the situation, but he changed our whole day by his positive attitude! When we all woke up from our naps, the night was so magical. We went on ride after ride without waiting in line and Goldie felt better and was happy. And I fell so much more in love with my husband that day. I knew I was choosing well when I said yes to him, but I had no idea he would be THIS good. The love grows bigger in those pesky little bumps in the road. 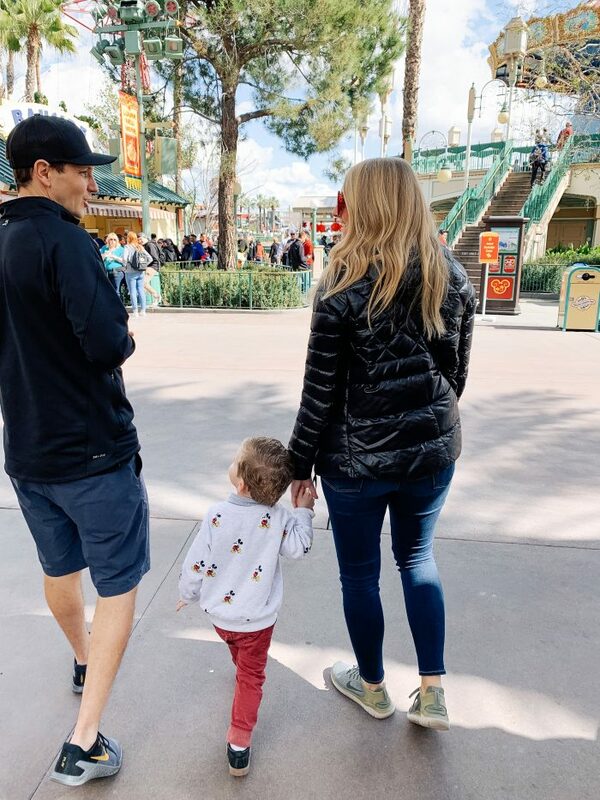 So…what do I recommend for Disneyland with toddlers what helped us the most? If you are going multiple days, don’t do the park hopper pass. You don’t want to have to rush back and forth from each park to the other. 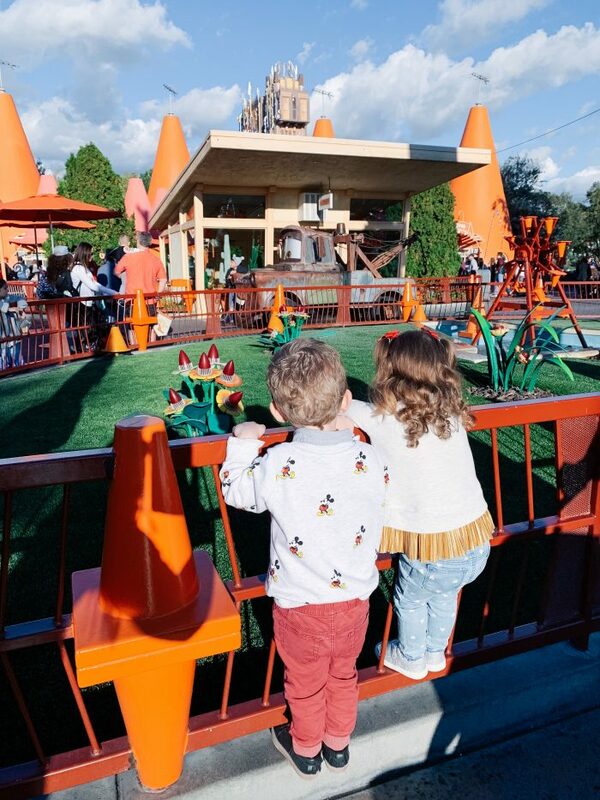 It’s hard enough to get toddlers from one ride to another. Just focus on one park per day and it will feel much less overwhelming! If you are only going to be there one day, and you don’t want to get a park hopper pass, go to Disneyland rather than California Adventure. They have WAY more rides and activities for little people. If your son or daughter is obsessed with Cars like my kids are, however, then it may be worth it for you to get the park hopper pass. 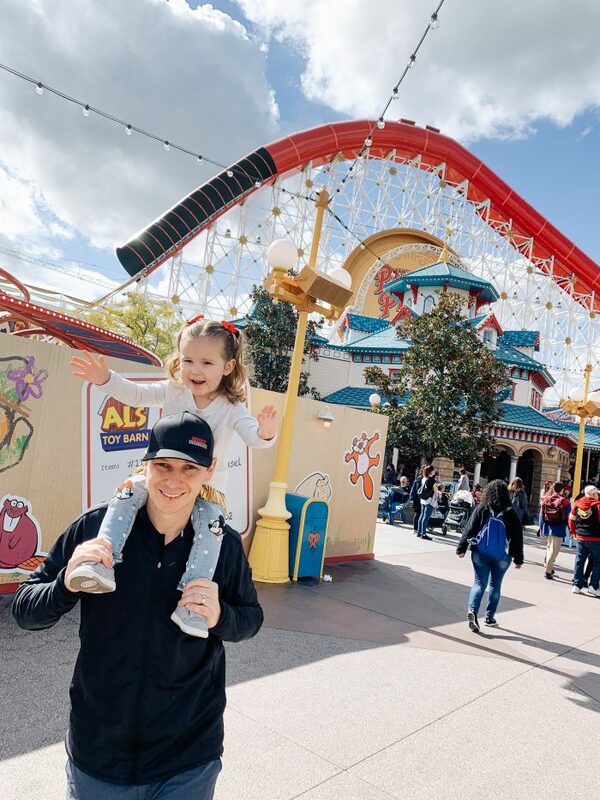 If your toddler doesn’t care about Cars, I would only recommend going to the Disneyland Park if you only have one day. Utilize the Disneyland app where you can reserve dining and order snacks and meals ahead of time to pick up. When people first told me about this, I didn’t really think it would make much of a difference, but it does, especially because some lines can be really long! We were SO happy when we went to the counter and just picked up our dinner literally right when we walked up at the Jolly Holiday. The Jolly Holiday is a great place for meals. It’s not very expensive compared to a lot of other places at the park. The tomato soup and grilled cheese was good when we were chilly, and they had a great kid’s meal. See tip #2 above. Order beforehand and MAKE SURE TO GET YOURSELF A RASPBERRY MACAROON!! I want to go back just for that. Bring a TON of snacks. I can’t believe how fast we went through ours, and the $5 churros can add up really fast. I wish I would have brought 3x the snacks we brought, because Tyler and I got hungry too. That being said, splurge on the snacks that you can only get there, like the raspberry macaroons, which by the way are a WAY better deal than the churros. They have delicious fresh, raspberries in them and they are the same price! Okay, I’m obsessed. Try to stay somewhere close. Honestly, I think the Disneyland hotels are crazy overpriced, but I will say that it was very nice being so close, especially with Goldie’s burned hand issue. 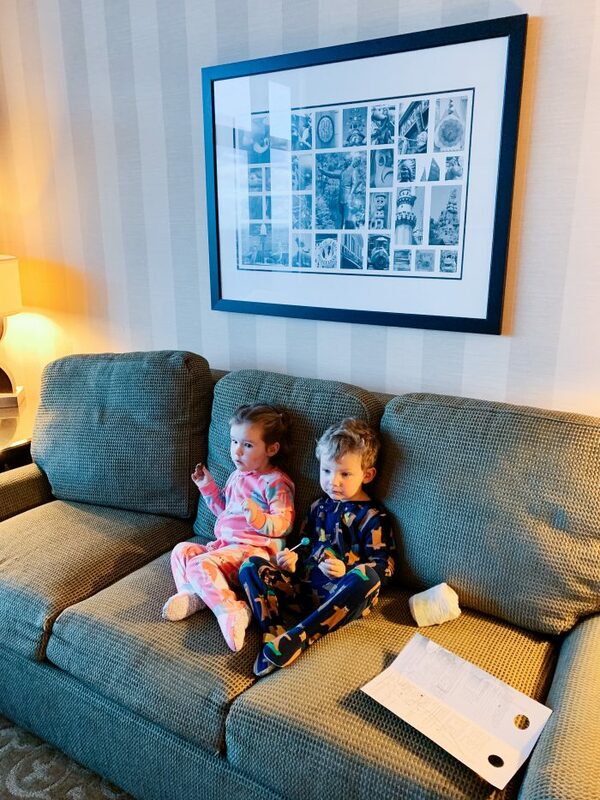 You just never know what you’re going to get with toddlers, and it’s nice to be close enough that you feel like you can go back for nap time or any other issue that may arise. If you stay close, you can utilize the tram that starts in Downtown Disney and lands you right in the middle of Disneyland which saves a lot of time walking. If your visit is during the winter months, bring extra layers and ponchos. The weather didn’t say it was going to rain, but we brought lightweight, cheap ponchos from Walmart and we definitely had to use them. 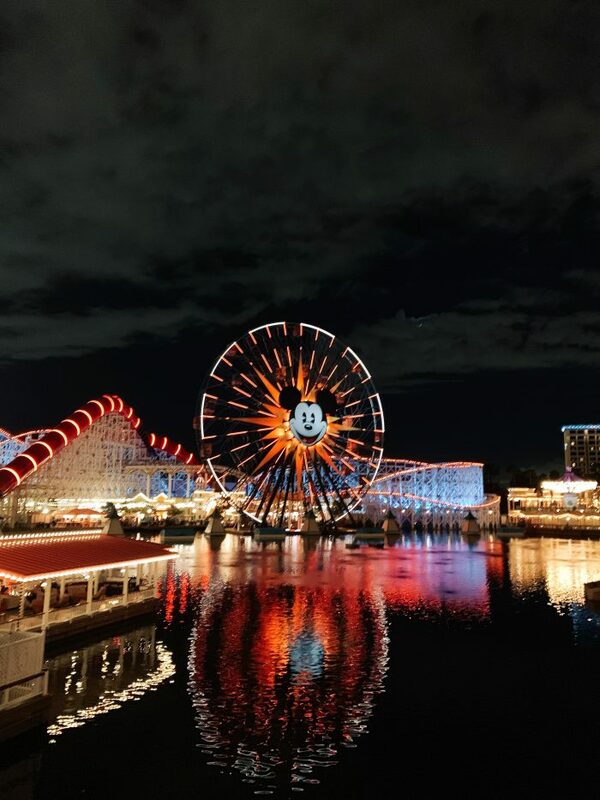 Booking through Get Away Today is a great idea because it will save you HOURS in planning your trip to Disneyland and you can save a lot of money, too! They have hotel + ticket bundles that make it simple. Plus, use code STYLE to save $10 more when you book a 2-night or longer Southern California package. (Hotel and 2 ticket minimum purchase to qualify for the discount). 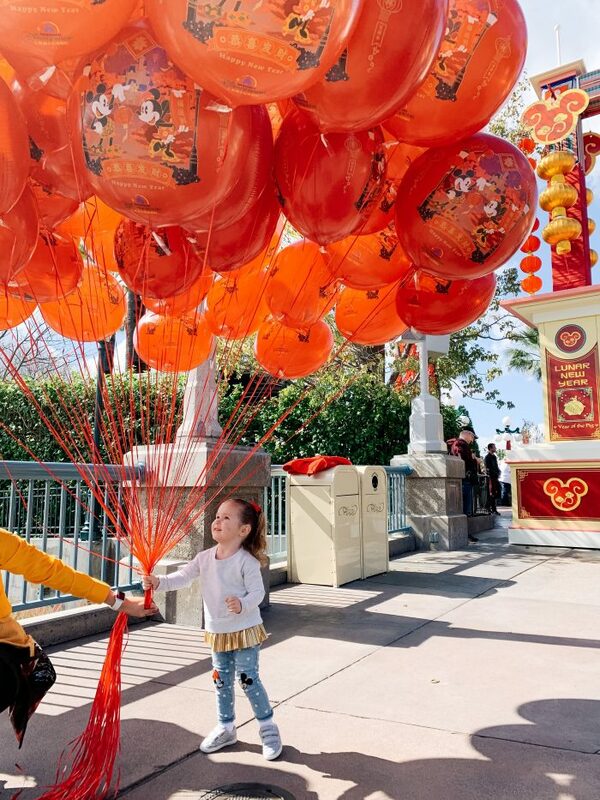 They also have vacation packages and tickets for Universal Studios Hollywood, the Southern California City Pass, Walt Disney World, Universal Studio Orlando. You can check out out Get Away Today here! 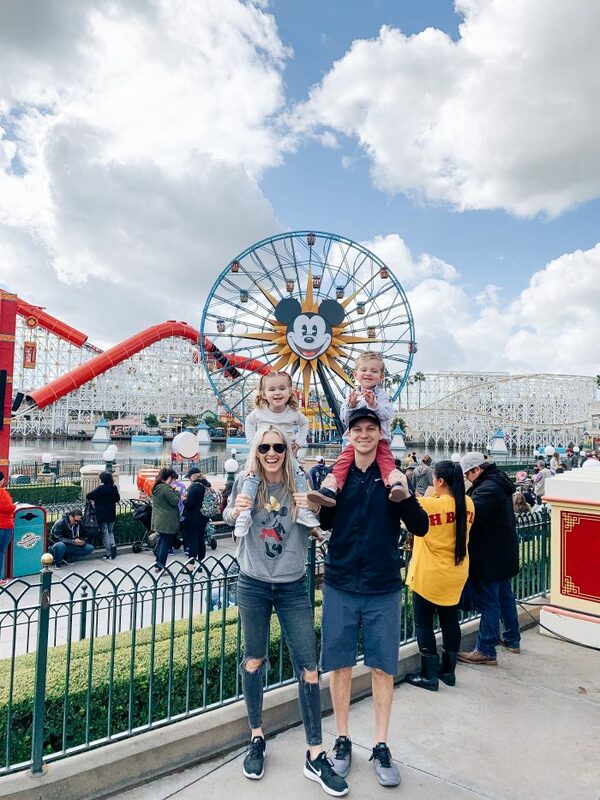 Disneyland is one of those places where I will gladly dress head to toe Mickey and Minnie Mouse because it just add so much more the MAGIC, don’t you think?!! And then when you wear it at home afterward, it just makes so smile so much thinking about the magic. 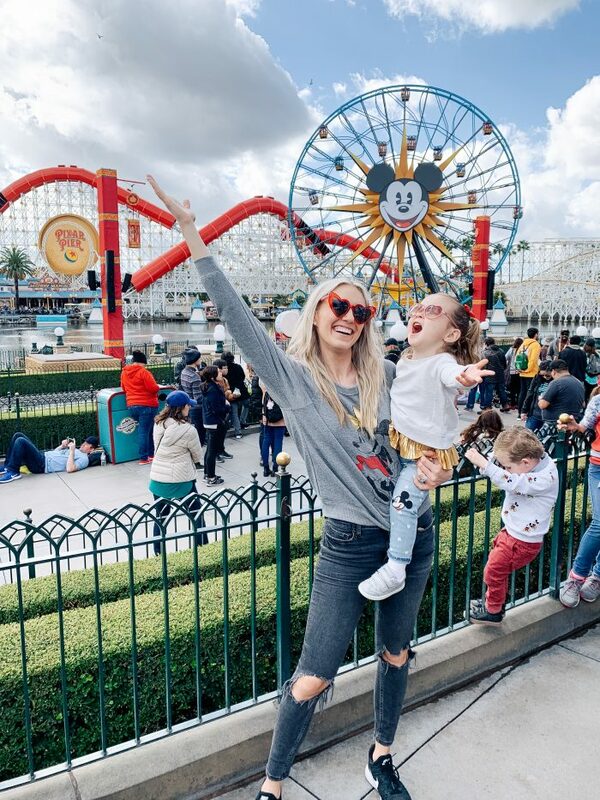 Loving this Disneyland with toddlers feature? Take a look here for more of my family fun favorites! Previous Post: « Affordable & Easy Kitchen Updates with Home Depot!